The chart below shows the performance of all of Verizon’s smartphones vs. the iPhone at AT&T. The area chart shows how Verizon’s volumes grew from 2.7 million in Q1 to 3.3 million in Q3. Not a bad story in itself. However, the iPhone at AT&T went from 2.7 million to 5.3 million in the same time frame. 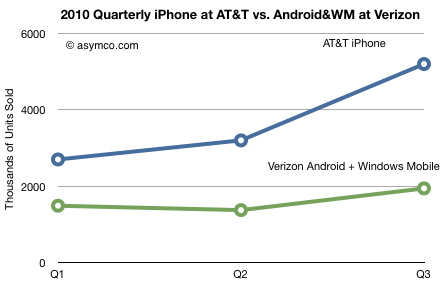 Relative to just the iPhone, Verizon has been underperforming over the last quarter. Those additional 2.4 million iPhone/AT&T activations in Q3 could be due to replacements but the same could be said for Verizon’s volumes. The fact remains that iPhone alone is nearly twice the volume of all of Verizon’s smartphone activations. Just to be clear, this is a direct, apples-to-apples comparison. AT&T and Verizon smartphone performance figures are highly comparable. The two operators are highly representative of the US market. AT&T and Verizon Wireless raked in 75% of all mobile data revenue in Q2 of 2010 and account for 62% of the U.S. wireless customer base. In addition, Verizon enjoys a larger customer base (has 92.1 million subs vs. AT&T’s 90.1 million.) Over the time frame of the data the overall market did not increase dramatically therefore the conclusion that AT&T’s win is Verizon’s loss is plausible. These are absolute volume figures. You can see how RIM’s fade was replaced to some degree by new vendors. However, growth hit a wall in August. Following widespread iPhone 4 availability, sales dropped. Coincidence? Perhaps, but the drop happened even with the addition of Samsung volumes. The other notable is that even though Verizon doubled the number of vendors selling smartphones, it seems they are growing their smartphone base slower than the overall market. From three vendors to six. Shares are roughly evenly split (except for Palm) but none of these vendors are able to drive volume growth. 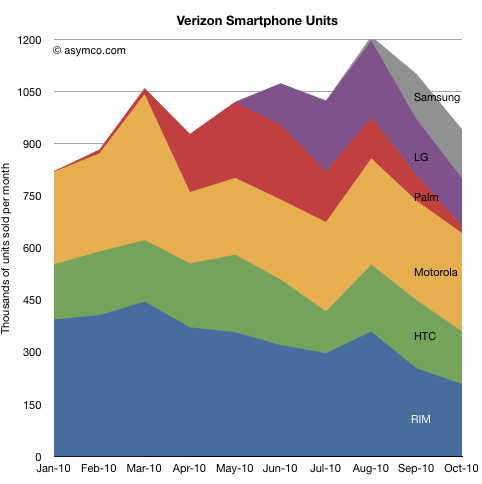 Consider that Motorola Droid is outselling RIM. This should be rightly noted as amazing. It plainly shows the power of Android. However that power is not something Verizon will benefit from. Quite the opposite. Android (and WM, though that’s likely to be a very tiny part of the green area) made up 75% of all smartphones sold in October. It’s possible that the share could grow to 90% as RIM continues to fade. For Verizon this would be a serious problem. 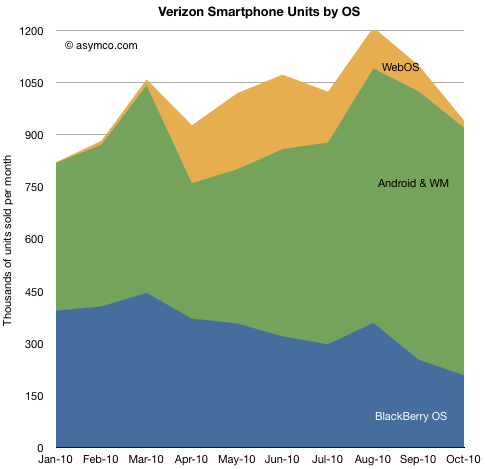 Although Verizon used to have a disproportionate share of RIM’s products, that OS was not enabling an ecosystem like Google’s. It was a product narrowly defined around messaging. Verizon is facing the prospect of a single OS supplier who may or may not maintain alignment with Verizon’s core profit algorithm. If they diverge, Verizon’s bargaining power will be strictly limited. Android is barely enough to keep the battle with AT&T from becoming a rout. In an apples-to-apples comparison, in Q3 the iPhone at AT&T outsold Android at Verizon (remember, same addressable market) by a factor of 2.5. This is with a variety of devices and vendors thrown in the market. We hardly ever get to see this finely grained a comparison when looking at platforms. I wrote this up as a lack of competitiveness. It may seem provocative, but I define competitiveness narrowly: the competition is for a purchase decision on equal terms. These purchase decisions are fiendishly complex to predict, but the data speaks: whether it’s due to brand, visibility or performance and in spite of “antennagate” the iPhone is cleaning up. By 2009, Verizon was probably optimistic that they could head off AT&T (and Apple) at the pass. With the vast array of vendor Android roadmaps laid out in front of them they saw a way to stem the flood of defections. I think that optimism dissipated sometime this year and was replaced by a more dreadful prospect than what iPhone presented in 2007. It is perhaps coincidental that the rumors of a Verizon deal with Apple seem to have started in earnest right after August. It’s thin, circumstantial evidence, but the only evidence we have to corroborate the data above is that Verizon has been signaling more desperation. Reading further into the data, I would say Verizon faced these problems and decided that they had to throw in the towel. Apple may be the devil, but so could be Google. Apple was predictably evil. But Google? The devil you know is perhaps better than the one you can’t predict. What’s more, the devil Apple seems to be helping your worst enemy way too much and the unpredictable one does not seem to help all that much. 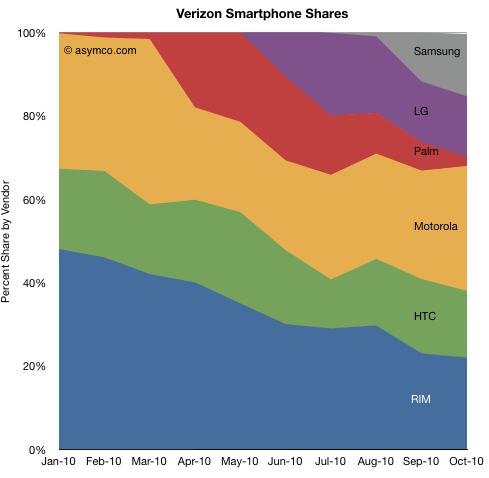 I think this data shows that Verizon has another reason to sell the iPhone. The underperformance of their smartphone franchise is not the only determinant, but it is perhaps another straw on the camel’s back. What would happen if (or more likely when) Verizon sells the iPhone? I believe they will sell them at the same rate as AT&T does. The data shows that Verizon sold, on average, about 3 million smartphones per quarter during the first nine months. That’s about 1 million a month. 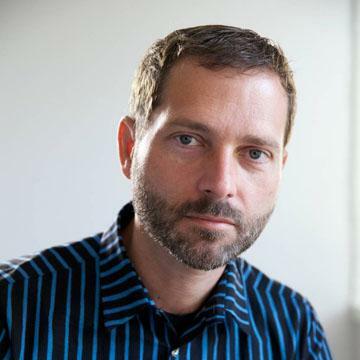 That was based on three platforms, six vendors and widespread promotion. The iPhone sold almost 4 million a quarter over the same time period. Verizon users bought smartphones at a lower rate than AT&T users bought iPhones. This is even though the two carriers have approximately the same subs base which churns very slowly. Since a mass-market product will appeal equally to statistically equivalent populations the product should be taken-up with similar vigor. So the question is not whether Verizon can sell iPhones at the rate of 4 million a quarter. The question is only whether these 4 million will be in addition to the 3 million that are currently buying non-iPhones. My guess is that the 3 million run rate for non-iPhones will drop, but not to zero. The impact on the other vendors supplying Verizon may be strongly negative depending on the level of promotion Verizon puts on the product. That promotion budget is usually fixed as a percent of sales. 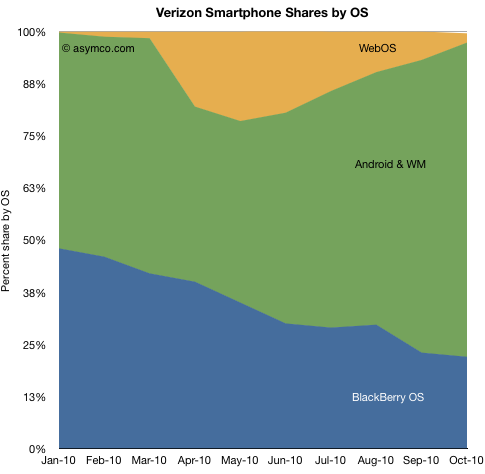 What Verizon applies to iPhone will be taken out of what is spends on Droid. I have always said that operators will be motivated to balance their supplier power. The promotion budget is the primary instrument to meet that end. On the other hand, the overall market will grow so 2010’s 3 million/Q will be 2011’s 6 million/Q. There is plenty of room for multiple platforms. 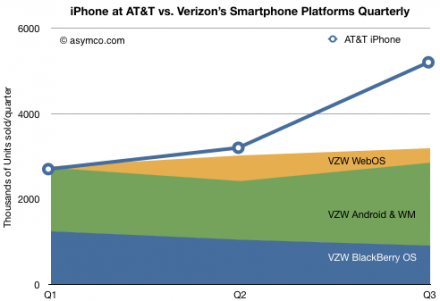 So my conclusion remains that iPhone will find at least 8 million new users with Verizon. The analysis above give me confidence to increase the upper bound to possibly 12 million. Verizon striking out means they need to change the way they play. The iPhone is a new ball game. To assemble this discussion I used only the data provided in the article linked above and the officially published iPhone activation numbers from AT&T. Obtaining specific smartphone vendor volumes is a matter of reverse engineering the share chart and cross-referencing it to the table of vendor sales.